More than a third of bloggers make less than $500 a month and only about one-in-ten make more than one hundred grand a year. This can be one of the most frustrating things for new bloggers, especially after seeing income reports from successful colleagues. In this video, I’m sharing my five favorite income sources that have helped me crack that six-figure payday in the last year. 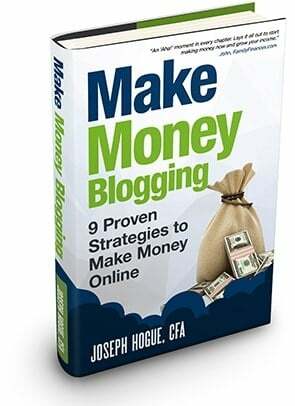 I’ll show you exactly how to make money blogging, how much you can make and reveal the secrets I’ve learned over the last six years. I’ve been blogging or working for bloggers for over six years now. I know too well the frustration that comes with not making as much as you thought you would. But once you learn how to make money, the best income sources and how to grow…the money pours in. Since 2013, I’ve built my online business to over $10,000 a month, that’s more than $300 every single day 24/7. It’s given me the freedom to spend more time with family, to travel wherever we want and to shrug off that crushing burden of paycheck-to-paycheck. 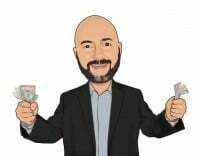 My blogs make money from seven different income sources but I want to show you my favorite five, the easiest to set up and that will start paying out fast. I want you to feel that same financial freedom and to be able to take control of your money. In each of these five blogging income sources, I’ll show you exactly how to get started, how to grow your income and how much you can expect to make. 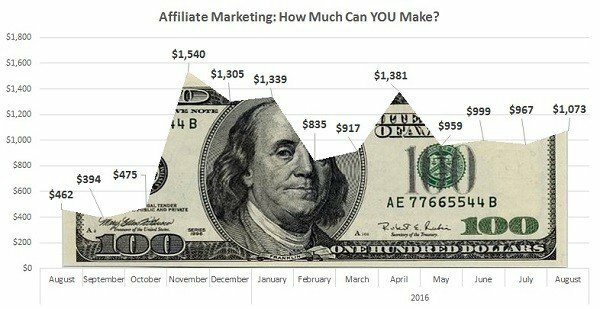 How do Bloggers Make Money with Affiliates? Our first blogging income source is affiliate marketing. This is where you partner with a company and then put a link on your site to their product or service. If someone clicks through the link and makes a purchase, you get a commission from the sale. Affiliate marketing is a great income source because you don’t have to create a product yourself, you’re just marketing an existing product. The company might have some brand recognition so people already know something about the product, there’s a little of that trust already there and there are ways to set this up so people have basically already made up their mind to buy when they reach your blog. I average about $3,500 a month on affiliate income which makes it just under a third of my total income. That’s pretty common for affiliate income to be a big chunk of a blogger’s total income. Until you put together your own courses or products, these are some of the easiest income sources to start. And getting started is really easy. You can go to sites like CJ Affiliate and ShareaSale which are called affiliate networks. Companies sign up on these sites to list their products and bloggers sign up to pick which companies they want to advertise. Once you’re signed up to the site, you sign up to any individual company programs that fit with your blog topic and get the links that you’ll include in your blog posts. You can share your link in a blog post on social media or you’ll even get ad boxes you can put in the margins of the blog. When someone clicks on a link, they get an identifier on their computer so even if they don’t buy right away, you get credit for any purchases made. The company tracks the purchases and sends commissions to the affiliate network which passes the money on to you in one check each month. So the process of affiliate marketing is extremely easy but I want to share some secrets I’ve picked up that will make you successful and help you make more money. First is that you can’t just drop your affiliate link in anywhere and expect people to click on it. You can put it in any post and I’ll show you how to do that but there are two types of articles that will account for the majority of your affiliate income. These are list posts and affiliate reviews. List posts where you either compare lots of products in the same category, for example 10 best smartphones, work well because you’re giving people a choice. You’re making it easy for them to compare and by the time they’re done reading, they’re more likely to have made a decision and are ready to buy. Another type of list post is where you list out resources or ways of doing something, for example 10 ways to make passive income. These work well because you can refer to multiple affiliate links and they’re not mutually exclusive so a reader might actually click on a couple of those links and you can get multiple payouts. The other type of post that works really well is the affiliate review. This is where you talk about one affiliate, give the pros and cons of the product and just really go into detail. These work well because anyone reading the post is probably far along in that buying decision where they know they need a solution and they’re close to buying something. Now rule number one for affiliates and doing your reviews is always to try the product first yourself and only review ones that you feel good recommending to your readers. Blogging is a long-term business and it does no good to ruin your blog short-term by recommending shoddy products. Now I say that those two types of posts are going to be the bulk of your affiliate income but you don’t want to ignore your other posts. Every post on your blog should have a purpose so if you’re not trying to get people into your email list or use one of these other income sources, then you should try finding a way to fit an affiliate into the conversation. 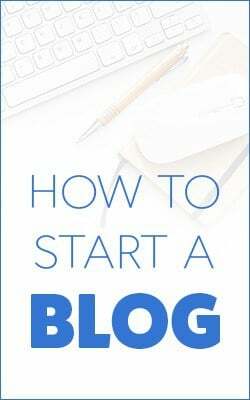 The idea here is that you never really know which posts are going to take off and bring in viral traffic so you want each set up to be doing something to either grow your blog or make money. Now this doesn’t mean just dropping in a sentence and an affiliate link. You’ll want to add in a couple of paragraphs to talk about how the product fits with the article topic and how it solves a problem. It doesn’t have to be a full review but you need to weave the affiliate seamlessly into the post to make it natural. Our third secret to affiliate success here is to concentrate on a few affiliates that really fit well with your blog and your audience. I make money on over 30 affiliates but the top five account for 80% of my income from the source. It doesn’t mean that you can’t try out new affiliates or that other 20% isn’t worth going after but you want to spend most of your time concentrating on those few that really resonate with your audience. These are going to be the ones you’ll do reviews on, you’ll add to list posts and even take the next step in creating a buying funnel. And that’s a trick that very few bloggers are using but works wonders is to set up that buying funnel for each of your best affiliates. So we already know that people don’t just click on a random link and buy a product. In fact, old marketing rules used to say that somebody needs to see a product as many as seven times before they’re ready to make a decision. This is where buying funnels come in and it’s a brilliant idea to keep people focused and convert more of those casual readers to an affiliate or even one of your own products. The way a buying funnel works is you bring a reader in through a post, so maybe talking about a problem or maybe through one of those comparison posts. Within that post, you offer a free handout or checklist that relates to the problem. When they go to download the handout, they get put on a special email list through targeting on ConvertKit. Now this isn’t your general email list but a special one that sends out a series of emails specific to that problem related to the affiliate. Since it’s super-specific like this, it speaks directly to that reader and their need. Over the next two or three emails, you can talk about how you had the same problem and how you solved it with this particular affiliate. These buying funnels are great because they build that relationship with the reader, they give you time to demonstrate how the affiliate solves a problem and the need. You might get one-in-fifty people that read your affiliate review to click through and make a purchase. With these buying funnels, I’ve seen it as high as one-in-ten. They’re more work because you have to put together that email magnet and the email series but they work wonders in making those sales. For your email provider, you’ll need a service that can separate subscribers into different lists and email sequences. I use ConvertKit for exactly this purpose. The email provider makes it extremely easy to set up buying funnels, segment your readers onto those lists and track the results. I’m going to share those other four blog income sources next, one that is easily my favorite passive income source, but if you’re just joining us, this is actually the fifth video in our start blogging series. This next blogging income source has huge potential and just one deal can mean a five-figure payday through sponsored posts and being a brand ambassador. There are a couple of levels here from just writing a post about a product and getting a flat fee to actually representing a company in videos. It’s really that next level of business for your blog. We’ll talk about the different kinds of sponsorships from the easy sponsored posts where you’ll make from $150 to $500 or more just for writing a post all the way to the brand ambassador deals that can net you thousands for a series of posts. I average about $2,250 a month on sponsorships though it’s really been growing through the YouTube channel and the inclusion of video. So one type of sponsorship is just a simple one-off post that includes a link out to the sponsor. These are pretty easy to get and can add some solid income for your blog but there are a few things you want to remember. First is that you don’t want to accept just any sponsored post for your blog. You’re going to get emails daily from people that want to link back to their casino site or payday loans. Link to those kinds of sites from your blog and it’s going to hurt your Google rankings so you want to keep the same rule here as with affiliate posts. Don’t link out unless you can feel comfortable recommending a site or product. Related to that is the price you charge for sponsored posts. A lot of those spam sites will ask to pay as little as $25 and then act indignant when you tell them your rates. Screw that! It’s your blog and anyone that wants a sponsored post needs to respect your site with a reasonable rate. I would recommend starting at $100 for a new blog and then raising it as your blog grows. Rates should be for a one-year link so they either renew the post or it gets deleted after the year. The real money in sponsorships though comes from those bigger brands and companies you can represent. This means building your site and your authority in the topic first but sign these deals and it’s usually for a thousand dollars and up. While most sponsored post opportunities will come to you, brand deals are something you have to seek out yourself. Create a customer profile of your typical reader, where they shop and what they buy. From this list, you can start to get an idea of the brands and companies that might be willing to work with you. You can also go to conferences related to your niche, or just look on the conference website, to see which companies are sponsoring the conference. Then you’re going to create what’s called a media kit or a one-sheet. This is what you show potential advertisers so it’s going to include any demographics you might have on your site visitors, you get this from Google Analytics, it’s going to include how many followers you have on each social media platform as well as email subscribers. You can put on there any statistics you have from prior brand deals or affiliate posts like average views per post, clicks and customer conversions. 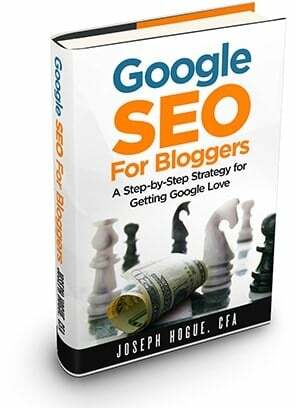 Another must-include that most bloggers miss are to highlight some of your Google rankings for keywords related to that specific company’s product. When you’re negotiating brand deals, try to sign for multiple months or posts. The work you put in on a brand deal is considerably more than sponsored posts because you have to get familiar with the company’s products and how to promote them. You’re going to be integrating mentions into social shares and posts and even videos so this isn’t something you want to do for a one-time post. I usually pitch a three-month sponsorship for brands or at least a three-video package. The fee you can charge for brand deals really depends on your reach and popularity as a blogger. For example, since my blogs are fairly small, I’m charging around $350 per post for long-term sponsor packages. For the YouTube channel though, I’m getting between $500 and $1,000 for each video. Understand that these aren’t something that you might sign every month but when you get a deal, it can be a few thousand over a couple months. One thing I want you to remember while we’re talking about these ways to make money blogging is that you need to diversify your income across multiple sources. You’ll see that none of these single sources are probably enough in itself but put them all together and you can easily build a six-figure income. 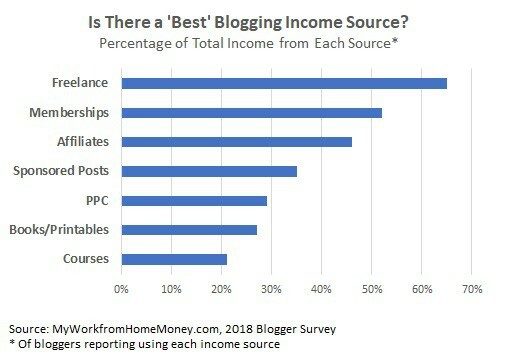 In fact, in a survey of bloggers I did in 2018, the average blogger earned money from four sources. Most made money from affiliates and sponsored posts with just under half using pay-per-click ads and one-in-three also doing some freelancing. Courses, books and membership sites also made the list of most popular income sources. Now everyone in the community knows I’m a big believer in our next income source, self-publishing. This is easily my favorite passive income source and can add thousands to your blogging business. Here what I want to show you is not only making money with self-published books but also using printables for the quick win. Self-published books are a natural fit for bloggers and I average just under $2,000 a month on ten books, so about $200 per book each month. So while your books will be longer, around 150 pages, and sell on Amazon, you can also put together quick one- or two-sheet checklists and guides to sell as quick printables. How Much Do Bloggers Make for Books? These printables are great as what’s called tripwires. This is when someone signs up for your email list and are immediately redirected to a landing page to sell a special printable for a few bucks. They’re already in that ‘yes’ attitude from signing up for the email list so if you can offer them a good deal on a printable, this can easily add a few hundred to your bottom line. Now I’ve shared my self-publishing strategy on the channel. You want to write each chapter out individually and put it up as a blog post. This not only keeps you on track to publish but each of those posts becomes instant marketing for your complete book with a link to Amazon. The fact that the chapters are there free on the blog isn’t an issue because your book might only be $4.99 on Kindle so people are paying for the convenience having it all together and maybe some extra content. The biggest thing with self-publishing is just to put it on your schedule and get started. Most bloggers overcomplicate it with months of research and worrying that they just don’t know enough about the topic. Believe me, if you’ve been blogging about something for more than a few months, you’ve become an expert in it. Break your book into manageable chapters, do a little more research for each but get it done and get published! I sell about 60 copies of each book each month so that’s totally achievable for anyone. You’re going to get some sales from the links on your blog and you can set up a couple of Amazon ads to spend maybe $20 a month. 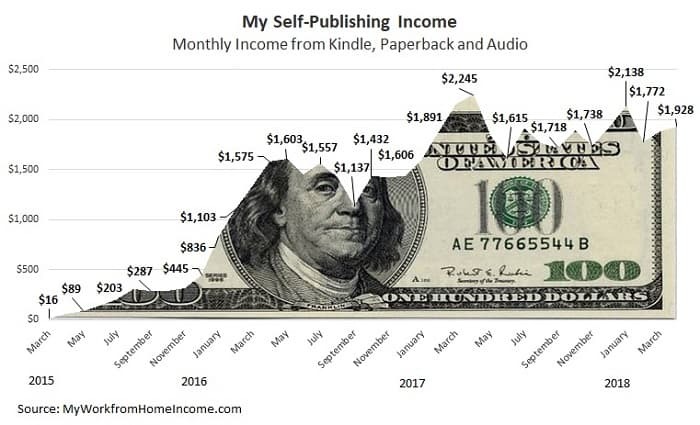 This is enough to keep your books ranked and make it completely passive income so you don’t have to do anything but write. Work it into your schedule and you can do three or four books a year. That alone is going to add another $800 a month to your blogging income. Again, I love self-publishing because it’s one of those income sources that starts paying out right away. 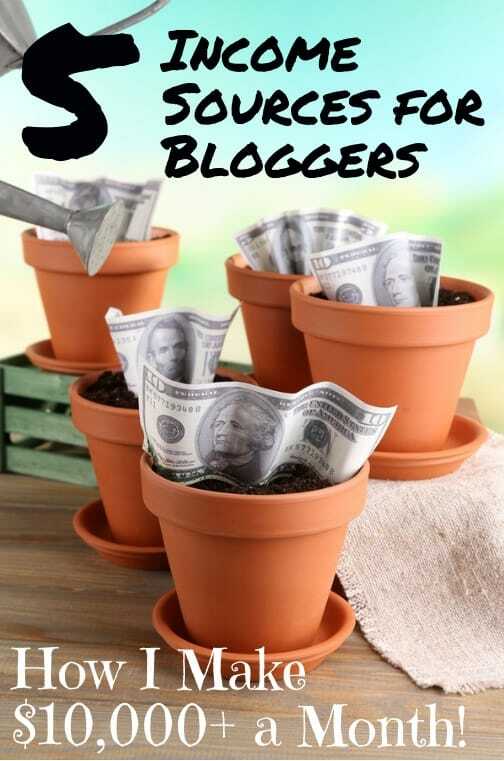 That’s going to give you the motivation to keep blogging so you can reach those higher paydays because the fact is, most bloggers quit before they start making any real money. In that survey I did, almost four-in-ten bloggers reported making less than $500 a month. Build your online business though and use the income sources I’m sharing here and you can break into that group of one-in-five bloggers that make more than $5,000 every single month. 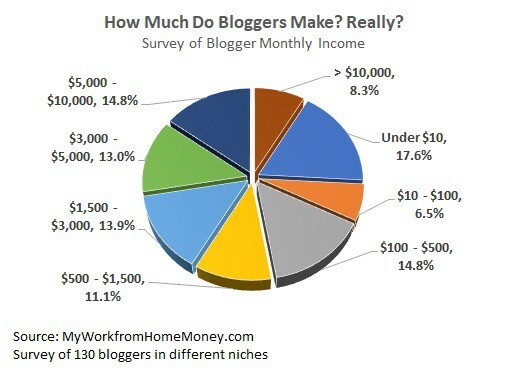 How Much Do Bloggers Make a Month? Our next blogging income source is a great one for creating recurring income you collect every single month and very few bloggers take advantage of it. Membership sites are separate from your free blog and charge a monthly fee for people to access extra content, forums, downloads or groups. The great thing about membership sites is that its recurring income. I’ve seen sites charge from $15 to $99 a month for access. I charge $49 a month for a private self-publishing website and usually have between 20 and 25 members on average. There’s some turnover, so for something like my membership site, people usually stay in it for three to six months but I’m always getting new members as well so it’s between a thousand and twelve hundred dollars a month. The sites that really make money are the ones with a longer member lifespan, the ones that can keep members engaged for years. The first step to setting up your own membership site is to hang out on a couple to see the extra features you get, how the owner engages members and the interactions. This will help see how things are run and maybe what you can bring to your site that adds value. While the membership site looks different from your blog, you don’t need a new site. You set everything up through a plugin for example memberpress or membermouse. These plugins will give you ability to have different membership levels for pricing levels, let you protect downloadable content, enable ecommerce features if you want to sell products like pdfs or courses beyond the basic levels. You can also drip content out so members don’t binge everything available then leave. Membership sites can be extremely easy to set up but there are a few tips you can use to keep your members engaged and make as much money as possible. First is you have to make the site about more than just the content. People can get that anywhere for free. Membership sites are about your story, helping members achieve your success and being engaged in their journey. Create group challenges and events to keep people engaged and make it a tight group atmosphere. You can even offer small prizes to those participating in the challenge for incentive. This is going to make the site a social platform as well as a place members go for the content. How Much Can You Make with Online Courses? This next income source, your own courses, is one of the biggest opportunities for bloggers. I just launched my first course late 2018 and average twelve hundred a month but I know bloggers that have hit the jackpot on their courses. I know Pat Flynn does over $40,000 a month on his podcasting course and Michelle from Making Sense of Sense has made over a million dollars in two and a half years on her course. The money is definitely there but I think a lot of bloggers get hung up somewhere along the way to launching a course. Maybe they think it has to be hours and hours and too detailed or they get caught up on the marketing they need to do. Like anything else, blogging or otherwise, you just need to make a commitment to get started. You can do this if you take it in chunks, put it on your schedule and just get started. The thing that surprises most people about courses is they don’t have to be hugely detailed or intense. I’ve seen courses that were as simple as a 30-page workbook and maybe an hour of video. I think this was one of my biggest mistakes with my first course. It ended up being over six hours of video, I have spreadsheets and handouts and all kinds of stuff in there. A great course doesn’t need to be that long. In fact, you can set this up just like you do self-publishing. Think about a transformation you want to deliver to your students then work backwards through the steps they need to take. Focus on a very specific, niche idea so maybe it doesn’t take more than a few hours of video instruction and some materials to get them from point A to B. For ideas, you can look at books on Amazon or other video courses on Udemy. Doing your videos can be as simple as a screenshare with the help of any video editing software like Adobe Premiere or Camtasia which is the software I use for all my videos. There’s a learning curve to it but nothing with the potential to make you thousands a month is going to set up overnight. 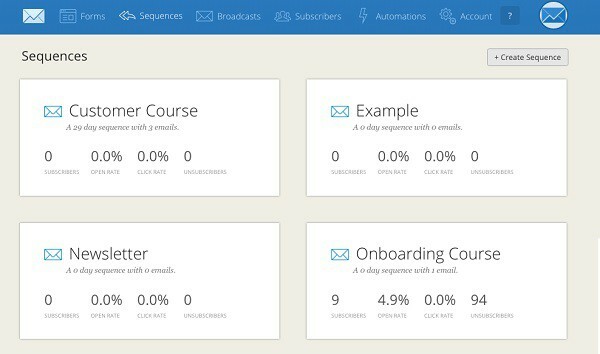 Once your course is done, I recommend Teachable to host the videos and collect payments. The platform makes it easy to manage students, promote your courses and even set up affiliates so you can get other people to sell your course for you. Teachable is offering a free webinar on creating and selling your course that includes some great tips. Making money on a website isn’t difficult and it doesn’t have to be frustrating. Learn the income sources bloggers use and how much they make on each. Get started on a few and diversify your income for reliable revenue from a blog.